Game Development for iOS With Unity3d is, in my opinion, one of the best road maps for beginning and novice developers for building a successful game – and it even has a few tips that the seasoned developers should take into consideration. While I am not by any means a game developer, I am definitely a game user – I know what types of games I like, I know what types of features will draw me into a game and keep me there, and author Jeff Murray guides prospective game developers to the final boss battle and beyond. After a very comprehensive index listing of where to find topics in his book (a detailed index will always win points with me), the author gives readers a brief history on his involvement with game development and a quick preamble on what is (and is not) covered by his book. Jeff’s honesty in regards to his successes and failures (learning moments) pulls back the cloak that generally hides the mysterious world of game development from the public at large. He also explains some of the tools that will be needed, where to get them, and how much they will cost – before readers start working through the book towards completing their first title. I appreciate the order in which Jeff has put his topics – the tools, basic resources and planning first, followed by learning to use Unity3D by creating a simple game and what to do after release. For those of you creating games on a Mac, there’s a “getting started” chapter for you as well. The author states near the end of his book’s introduction that he hopes new game developers will be able to use this book as a jumping off point – it is meant to give readers a good foundation upon which to build, and hopefully avoid the pitfalls he touches on in Chapter 1 – Designing Your Game. The author’s writing is very personable – at times it almost feels like he’s either sitting across the table or giving you tips while watching over your shoulder. It is obvious from page one that Jeff Murray has written this book with great care and attention to detail, all the while avoiding sounding like a dusty old textbook. He tries to instill in the “young” developer good habits to follow when embarking on a game development project – right down to stress, work-life balance and setting attainable goals for yourself. 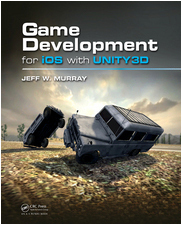 Game Development for iOS With Unity3d is rife with extra resources such as website urls, working code and screenshots to help the reader understand and expand his or her knowledge of the game development process, as well as charts comparing software license versions that will give you what you need to complete your first title. The author also walks new iOS developers through the process of obtaining an Apple ID for game publishing and adding devices to your Developer Centre. Once you have read the first three chapters, it’s time to move on learning the basics of the Unity Editor. I don’t recommend skipping over the early chapters, because there is much to learn, and those first few steps covered in the primary chapters will quite possibly save you much time and money with your project. The game development sections of this book (Chapters 4 through 8) take you through the steps of visualizing the project to creating the project to the crucial testing and debugging stages in easy to understand descriptive terminology – and for any terms you may not be familiar with, there is a comprehensive glossary at the back of the book, and Jeff does an excellent job of explaining the terminology along the way as well. There are two full game projects given by the author which are designed to help readers understand the mechanics of both game development and Unity3D itself. Working through these two projects step by step – and taking notes along the way – will indeed help the reader understand each component of the development process and cement a good foundation for pursuant game development projects. There is also reference information comparing free, downloadable titles with priced titles, in-app purchases and more – but you’ll have to read the book to get all of the goods, so to speak. Once you have developed your game and submitted it to Apple for review, your work is not yet done. While waiting for your title to be approved, there is much work yet to be done, such as marketing your game, something you, as an independent developer, will need to be on top of. If no one knows about your game, how can you expect them to grab it from iTunes once it’s released? Chapter 9, Section 9.5 delves into launch dates and making your game live on the iTunes store. It is immediately followed with how to find your game amongst the thousands of titles already there, as well as the importance of downloading your game and testing it once it has been released. Section 9.6 offers several good ideas on how to market your game, from writing press releases to developing press kits and giving out promo codes, as well as how to contact media outlets who cover game releases (Ours included – and at this point I must thank Jeff for the double mentions in his book). The author also offers tips on the importance of good icon design and how to write a concise description of not only your game, but of its features and what it offers the player. But wait, that’s not all this book has to offer. Jeff has also included places where the reader can go for further learning, such as the Unity wiki and site forum, as well as social media, where you can find many, many game developers who can assist with problem solving and tips. My overall impression of this book is that it is well worth the investment; it is both well written and well edited. Jeff Murray has certainly covered the many aspects of mobile game development in a way that is meant to encourage creativity and hopefully minimize frustration as the budding game developer works along the path to publishing the next great game title on iTunes. This entry was posted on Monday, October 15th, 2012 at 5:03 am and is filed under Books, National News, New Releases. You can follow any responses to this entry through the RSS 2.0 feed. You can leave a response, or trackback from your own site.